Coopers EctoforceTM Sheep Dip sets a new standard, combining modern packaging techniques with the broad-spectrum activity of the organophosphate (OP) diazinon. This unique combination ensures proven and highly effective control of external parasites with convenience and safety for the user. Water-soluble technology has enabled dip charging and replenishment to be a simple and time efficient process. Measured, accurate replenishment on a head count basis, as opposed to volume refill, will optimise the effectiveness of the diazinon. The key to operator safety when handling potentially hazardous substances is to minimise the opportunity for contact with the concentrated chemical. Closed-transfer systems, where there is no contact between the operator and the chemical, are now required for the handling of OP dip concentrate. Schering-Plough has responded to this directive with water-soluble packaging; probably the simplest method of ensuring closed-transfer. Coopers EctoforceTM Sheep Dip is sold in 5 x 100ml packs. Each pack is enclosed within an outer aluminium foil bag and a transparent plastic inner bag containing the water-soluble sachet. Both bags have a tear strip at the top of the bag, removing any need for tools to open the packaging. Simply remove the outer foil bag, tear the top off the inner plastic bag, move to the dip bath, and invert the bag close to the water surface releasing the water-soluble sachet. Simply allow five minutes for the bag to dissolve and then thoroughly mix the dip bath. All remaining packaging may be disposed of as normal domestic waste. 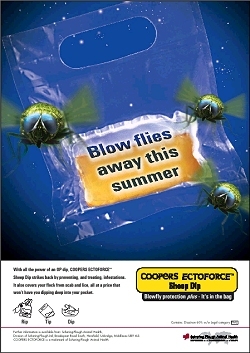 Coopers Ectoforce is a registered trademark of Schering-Plough Animal Health.